Compact design with three integrated footswitches, sophisticated sound control, and 297 user patches. 32-bit AD/DA and high-precision 32-bit/96 kHz internal processing, delivering sound quality that’s on par with high-end studio gear. Selectable true-bypass or buffered-bypass operation to suit the needs of any setup. Intuitive top-level knob interface for easy effects selection and on-the-fly tweaking. Deep-dive sound-shaping parameters under the hood, easily viewable from a large integrated display. Use two patches at one time with A/B Simul mode. Access top-level on/off control of three different patches with A/B/C mode. Powerful assign function enables real-time control of up to eight parameters at once, accesible via the onboard TAP/CTL footswitch, external expression pedal or footswitches, and MIDI. USB connectivity and dedicated editor/librarian software for each pedal. The intensely powerful RV-500 puts a world-class studio reverb processor at your feet. It offers 12 modes and 21 reverb types, providing everything from standard room, hall, and plate reverbs to shimmer, non-linear, fast decay, SFX, and more. Also on hand are authentic recreations of two classic Roland products: the SRV-2000 rack reverb from the 1980s, and the RE-201 Space Echo, one of the most revered tape echo units ever made. Each reverb type includes a huge selection of sound-shaping parameters to tweak, including modulation, ducking, EQ, and more. And thanks to the RV-500’s powerful DSP, you can also access a full-featured digital delay with modulation along with every reverb patch! Offering 12 modes and 28 different mod types, the ultra-versatile MD-500 houses just about any modulation effect you’d want in one great-sounding stompbox. Included are BOSS’s famous CE-1 chorus and Roland’s legendary Dimension D, modern BOSS classics like Slicer and Overtone, plus flanger, tremolo, phaser, vibe, ring mod, and more. 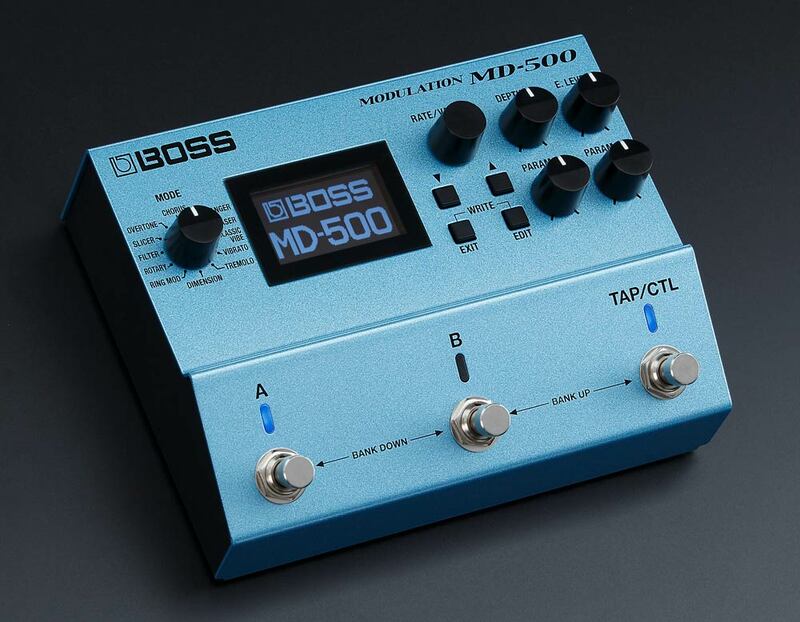 Many of the effect modes include advanced Prime variations, which have been newly developed specifically for the MD-500. And with the Insert Loop function, you can position mod effects around overdrives, distortions, and other external pedals to achieve the best sound on a per-patch basis. 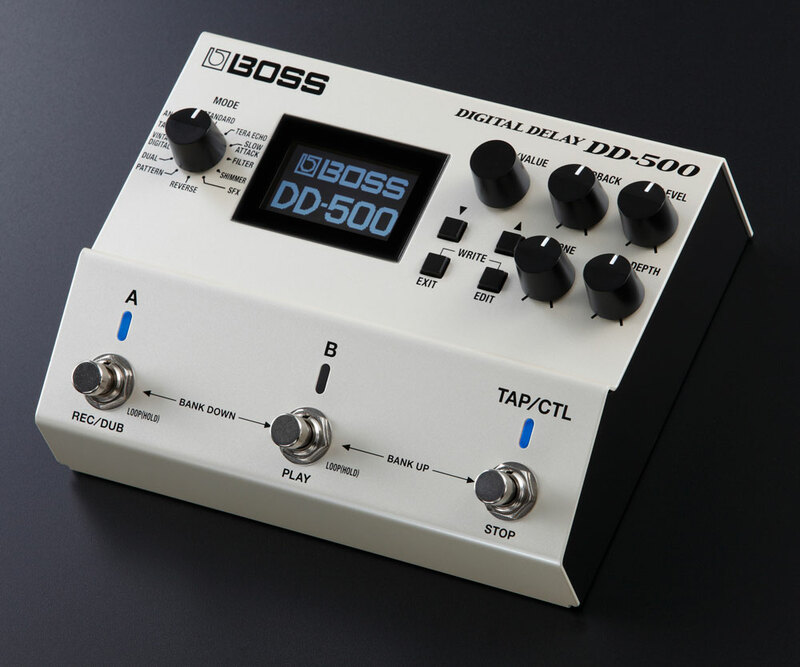 The DD-500 features 12 different delay modes, and each one has been carefully crafted for a unique sonic personality and highly musical tones at every setting. Included are basic single and dual digital delays, warm analog and tape echo types, pattern-based effects, and complex modern delay lines that employ pitch shifting, filtering, and other unique processing. The DD-500 also includes a Vintage Digital mode, which offers spot-on emulations of sought-after classics from the 1980s. Roland’s legendary SDE-2000 and SDE-3000 rack units were staples of touring pros for years, and are recreated in the DD-500 for the first time ever. Also represented is the BOSS DD-2, the world’s first stompbox digital delay and an enduring favorite of players everywhere to this day. Along with its other capabilities, the DD-500 includes an independent looper with up to 60 seconds of stereo recording time (120 seconds in mono). 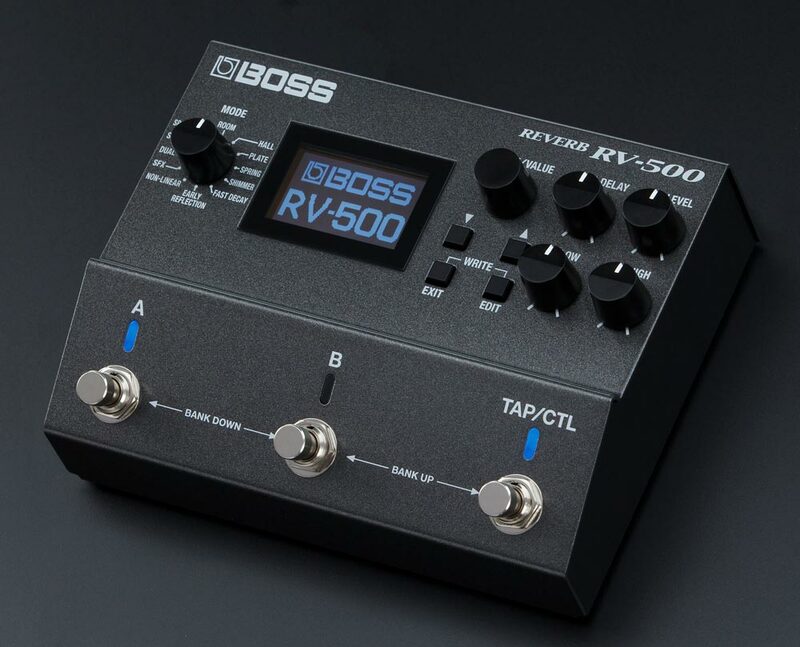 Learn more about the BOSS 500 series and our entire effects lineup at boss.info.